We believe your charting application should do the work for you. We also believe that Big Data will help you trade less and still make powerful trades. With WallStreet.io, you get access to the best technical analysis charting platform in the world. Let Smart Studies illuminate the way. 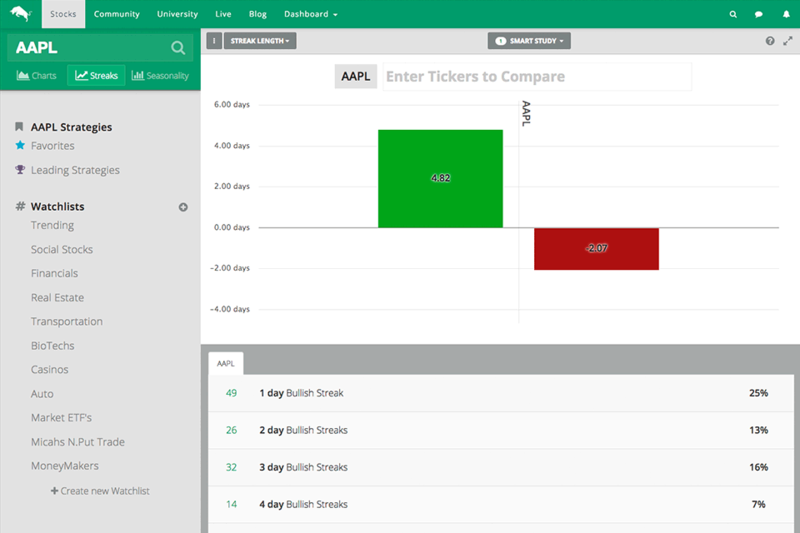 Smart Studies makes it easy to create and evaluate complex trading strategies. Back-testing has never been so easy. 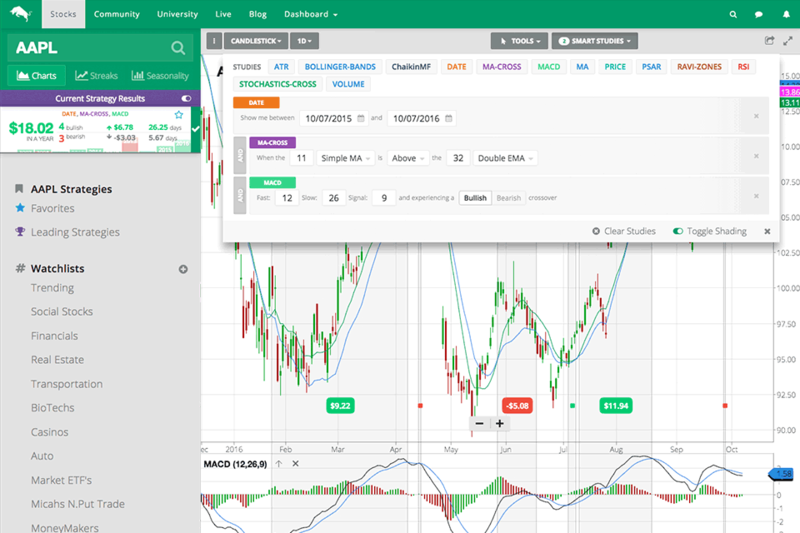 Control your chart and your Strategy at the same time with easy to read studies. 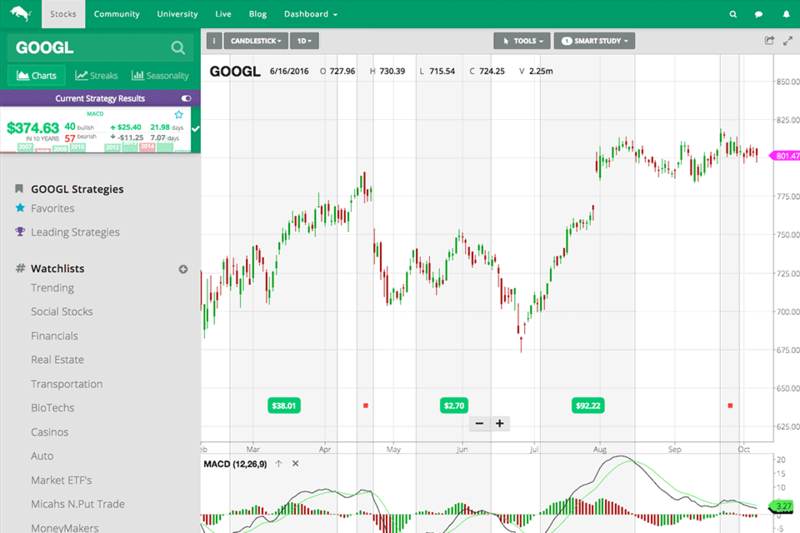 The Visual Trade Log shows exactly when your Strategy wants to buy and sell, shaded directly inside the chart. See the trades your Strategy is really suggesting. There is no magic here. All trades use end-of-day data, so you don't have to be glued to charts during market hours. The Current Strategy Results shows your Smart Study's performance at a glance. We breakdown your Strategy into the actionable data you need, right where you need it. 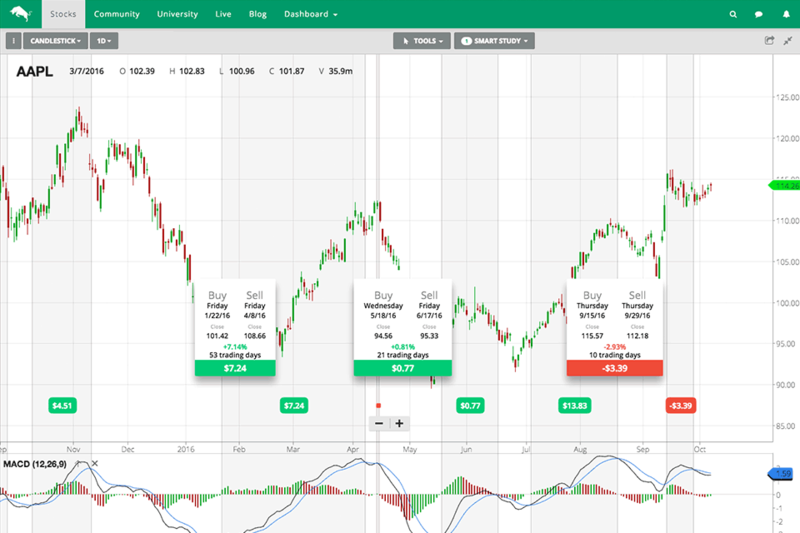 Quickly see your Strategy's profitability, yearly effectiveness, win-loss ratio, and average draw & duration when bullish or bearish. Is high frequency trading working against you? We built a super processor in the cloud for you. Prometheus is our first super processor designed to find the most effective bullish and bearish strategies for any company. Leading Strategies shares all discoveries right next to the charts. Our Community simply votes on which stocks to evaluate and Prometheus does the rest. Use an optimized, back-tested Strategy that works for your favorite stock and your trading style. Do you know when it's safest to trade? We created more Intelligence Tools for you. 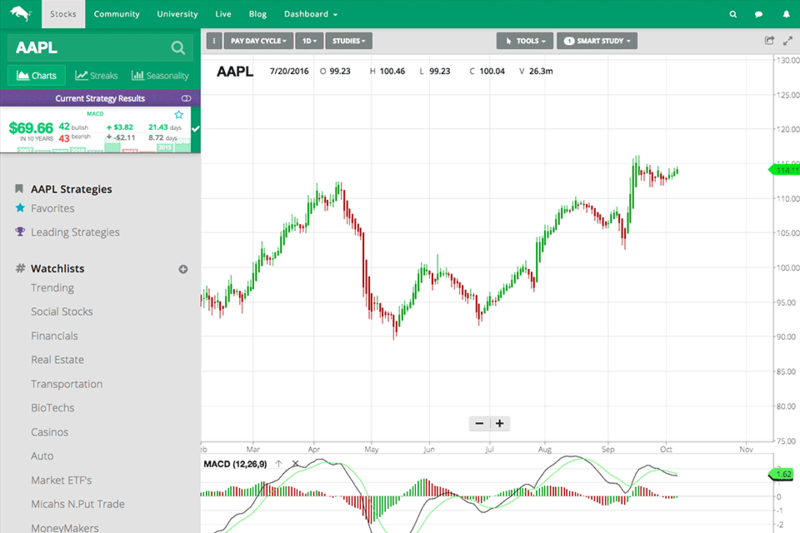 Our Platform streams up to 10 years of historical quotes directly into the Charts for over 8,000 stocks and ETFs. No broker account required! We paired our University training with core features inside the app. Learn about the PayDayCycle framework in the University and then go to the PayDayCycle Chart to quickly start using it. 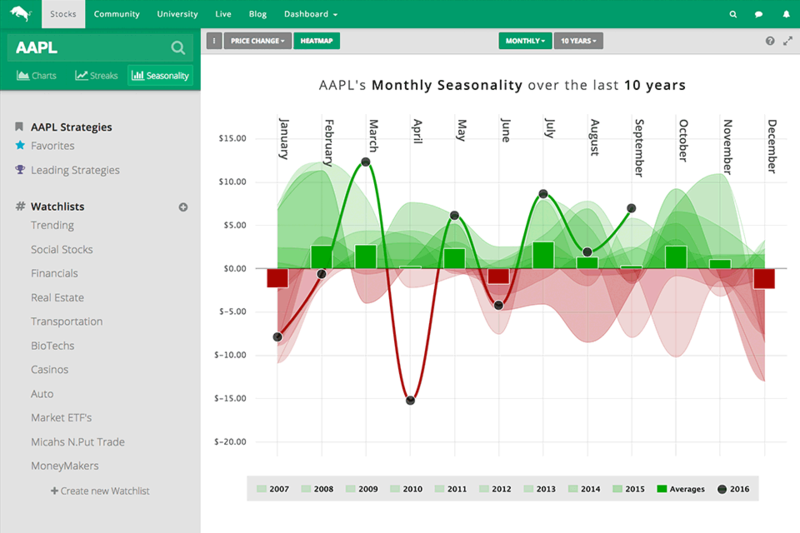 Smart Seasonality shows if a stock experiences seasonal pull. Quickly see if your strategy is typically bullish this month, or bearish the next. Heat-mapping shows which years affected the seasonal averages the most. Winning Streaks shows how long a stock trends up and down. Isolate your trades with Smart Studies for more perspective on the micro-trends within your Strategy. 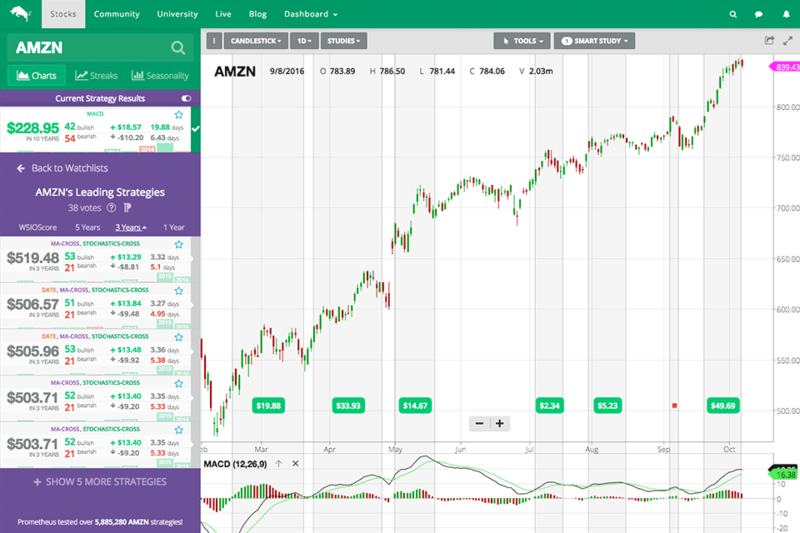 Use this tool to make quick, data-driven trades between the peaks and troughs. We have a University packed full of educational videos. Click here to learn more about the WallStreet.io University.